Montreal’s skyline welcomed a plane carrying a huge Victory Day banner as part of celebrations organized by descendants of Soviet veterans. Communities across Canada marked 70 years since victory over Nazi Germany in WW2 with rallies and parades. 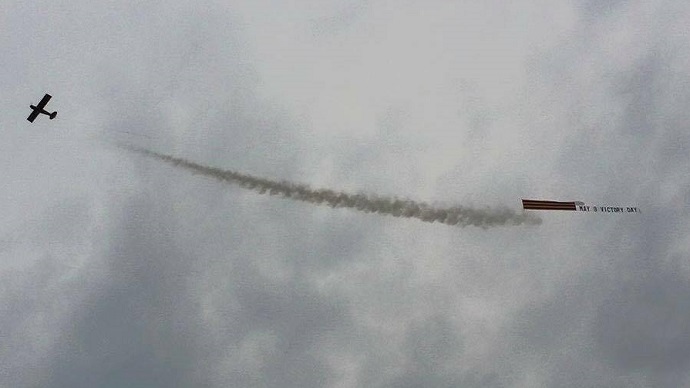 People who gathered to honor the memory of Second World War heroes and victims in the Quebecois city of Montreal on Saturday watched a plane soar in the skies with a large ribbon of St. George flying behind it. The action was proposed by activists and authorized by the city. A V-Day auto rally organized by a Russian activist on Facebook turned out to be hugely popular, with several hundreds of cars reportedly showing up for a procession. As well as carrying Red victory banners and simply Soviet flags, some took Russian, Belorussian, Ukrainian, Kazakh, Moldovan, Canadian and other national flags. After the rally, participants gathered in Montreal’s Angrignon Park to honor the living WW2 veterans and share stories. The capital city of Ottawa also had its own auto rally as well as a parade, both of which went through the city’s center, passing the parliament, Russian embassy and Canadian War Museum. Meanwhile, the Russian Embassy in Ottawa commemorated the 70th anniversary of Victory Day by inviting WW2 veterans and honoring them along with other members of the community. War witnesses spoke at the ceremony and Russian Ambassador to Canada Alexander Darchiev unveiled a monument honoring those who fought in the war. Toronto, Canada’s most populated city, marked the day with parades and activities for the war veterans. People participating in the march wore St. George ribbons, carried flowers and displayed pictures of their relatives who died in the war.